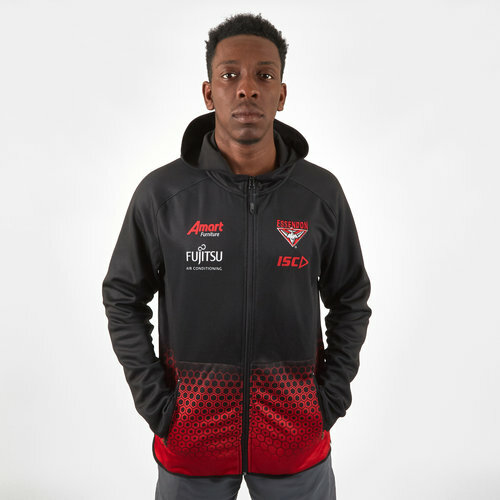 Don your heart on your sleeve when you pull on this Essendon Bombers 2019 AFL Players Hooded Sweat from ISC. The Bombers are a professional Australian rules football club that plays in the Australian Football League (AFL), the sport's premier competition. A founding member club of both the Victorian Football Association, in 1877, and the Victorian Football League (renamed the AFL in 1990), in 1896, Essendon is one of Australia's best-known football clubs. Essendon has won 16 VFL/AFL premierships, which, along with Carlton, is the most of any club in the competition. The club won four consecutive VFA premierships between 1891 and 1894, a feat unmatched in VFA/VFL history. This zip-up hoodie has been crafted from brushed fleece. It has been cut in a contemporary design with simplistic styling throughout. It is black fading to red via a honeycomb design. The ISC logo is on the left side of the chest just underneath the team badge.